Arsenal Technical High School, once the United States Arsenal, includes a Civil War armory complex and 20th-century buildings on its campus. As the oldest military installation in central Indiana and the oldest high school in the city, the campus has dual significance. Tech, as Indianapolis residents call it, did not begin as a school but as a Civil War arsenal. In 1862, Congress passed an act to create a permanent U.S. Army arsenal in Indianapolis. Army planners chose this site in 1863 at present-day 1500 East Michigan Street, because it had close access to downtown Indianapolis but also afforded security and would not disrupt any neighborhoods. The first soldiers arrived in 1865, and the U.S. Government maintained the arsenal here until 1903, using it to store heavy artillery, lighter arms, and some munitions. After the Spanish American War, facilities like this were dubbed obsolete for military needs, and by this time, the city had fully encroached on the site. 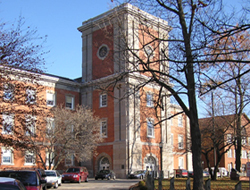 Winona Technical College bought the site at auction in 1904, but lasted only until 1910. At the time, the Indianapolis Public School system was in great need of a third high school. In 1912, Principal Milo Stuart opened Arsenal Technical High School on the grounds. The school still remains today. Many of the buildings are original to the U.S. Army’s use of the site, while others were added to accommodate the school’s functions. The iron gate and brick Italianate guard house on Michigan Street date to the 1870s. Soldiers arriving late from a night on the town were detained in basement cells in the guard house. The Arsenal Building was completed in 1867. Its central tower originally served as an elevator. Wagons could pull up under the tower and be hoisted up by a platform. Once in place, rifles, cannon, or other materiel was unloaded at the appropriate floor. The internal floor system was replaced by a pan joist system in 1932. The massive, monumental three-story building with full basement with its soft red-brick exterior and Vernon, Indiana, limestone trim looks very much as it did in the 1860s. The 1867 barracks is one of the earliest remaining buildings on campus. It once housed the detachment of fifty soldiers that staffed the arsenal, but now is used for educational activities. The West Residence, 1870, accommodated officers. A massive Shop Building and Stuart Hall were added to the campus in the 1920s and 30s. 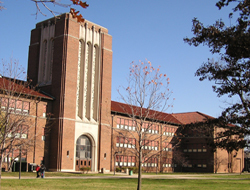 Arsenal Technical High School is located on the near-east side of town, at 1500 East Michigan St. and is open to visitors. Visitors must register at the main desk and are encouraged to contact the school for access, 317-693-5300. Attend a high school football game in the classic Deco stadium. Consult the school’s web page for game schedules. INDYGO bus line from downtown: #3 Michigan (Eastbound), disembark at Oriental, walk up Oriental to Michigan. The U.S. Arsenal, Arsenal Building has been documented by the National Park Service's Historic American Buildings Survey.